A science advocate responds to the criticism that “evolution is just a theory,” explaining that, for scientists, a “theory” is a thoroughly tested, well established explanation. In some venues, this is a familiar trope. Yet, not only is this completely, utterly wrong, but anyone with a brain and an internet connection can verify that it’s wrong in minutes. Instead, scientists for 200 years have used “theory” for conjectures that are not well established, even ones whose truth is rejected, e.g., Lamarck’s theory. What is going on? The term “theory” may have multiple uses. Indeed, I wrote previously (theory vs. theory) that scientists routinely use the word “theory” to mean either (1) theoryC (concrete, conjectural), a big hypothesis or major conjecture, or (2) theoryA (abstract, analytical), the body of principles relevant to some topic. We use the same word, but we actually treat the two kinds of theory differently, e.g., a theoryC can be refuted by facts but a statement in theoryA is either logically correct or not, regardless of any facts. A third meaning of “theory” has emerged in the science advocacy literature. 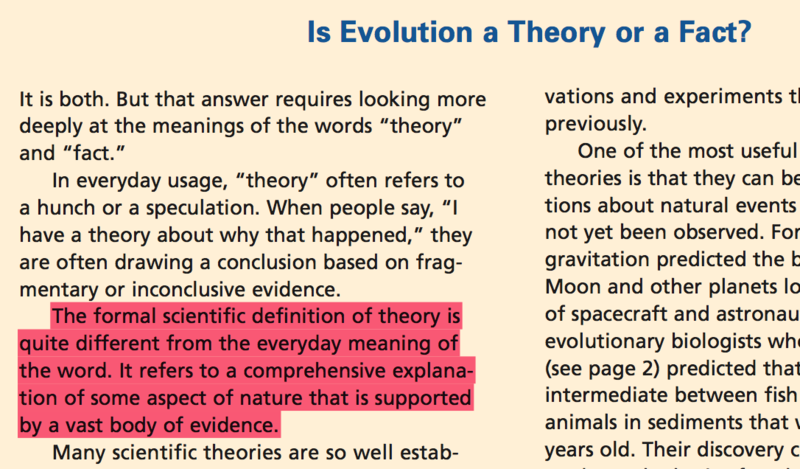 According to NCSE screeds, scientists reserve the word “theory” only for constructions that have been extensively verified and are accepted as true, thus the use of “theory of evolution” among scientists means that evolution is well supported. Likewise, the NAS web site explains, in regard to evolutionary biology, that a theory is “a comprehensive explanation of some aspect of nature that is supported by a vast body of evidence”. This is said to be a “formal scientific definition,” but no sources for this definition are given. Unfortunately, the NAS definition is clearly contradicted by usage, even in the case of the examples cited by NAS, e.g., atomic theory and plate tectonics. These ideas were known to scientists as “theories” long before they were widely accepted. For instance, Roscoe and Harden (1896, A New View of the Origin of Dalton’s Atomic Theory. London: MacMillan and Co.) published an account of the origins of Dalton’s atomic theory, based on notebooks, correspondence and so on. 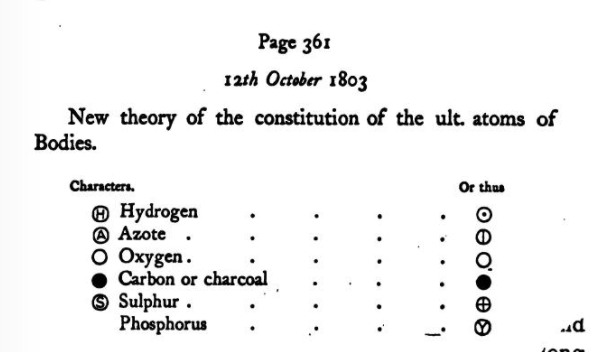 On p. 11, Dalton is quoted referring to his “theory of mixed gases” (a precursor to the atomic theory); on p. 45, we see a facsimile of a notebook page dated 1803 (figure, right), referring to a “New theory of the constitution of the ult. [ultimate] atoms of Bodies”; and on p. 253, one finds Dalton’s colleague Thomson writing about his “theory” and about other incompatible “theories”. The moment that we see a scientist referring to 2 or more alternative theories, we know that “theory” cannot mean what NAS and NCSE assert. 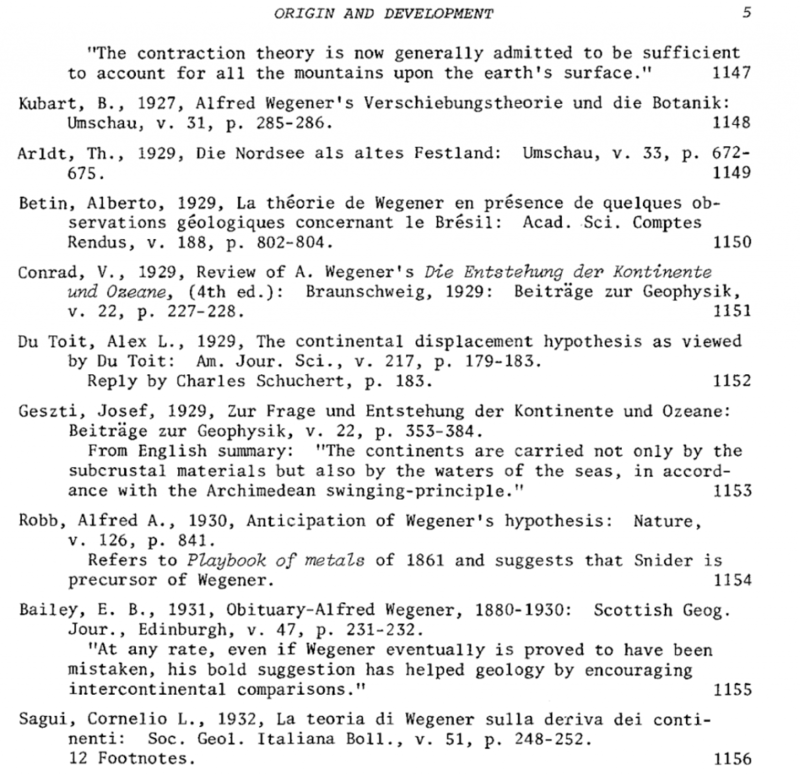 The theoryC of continental drift proposed in 1912 by Wegener remained controversial for a half-century due to lack of evidence, and lack of a credible idea for what forces could move continents, and yet was known during this period as the “drift theory” or “continental drift theory”, e.g., as in a 1928 symposium reviewed in Nature. Wegener himself referred to it as the “displacement theory”, e.g., his 1929 book begins with “Entstehung der Verschiebungstheorie”, the origin of the displacement theory. The evidence that scientist use the word “theory” for conjectures is simply that they apply it to ideas before they are well established, and they may refer to competing ideas, or even rejected ideas, as theories. The image below is a snippet of p. 5 from Kasbeer’s 1975 “Bibliography of Continental Drift and Plate Tectonics,” showing references to theory in German (theorie), French (théorie), Italian (teoria) and English (theory). Bailey’s reference to Wegener’s idea as a “bold suggestion,” indicating its speculative nature. So, we know that, a century ago, European and American scientists used “theory” to refer to conjectures, including a conjecture that is not well established. I could give many other examples, e.g., de Vries’s “Die MutationsTheorie,” Mereschkowski’s endosymbiotic theory, Wright’s “shifting balance theory,” Kimura’s Neutral Theory, and so on. 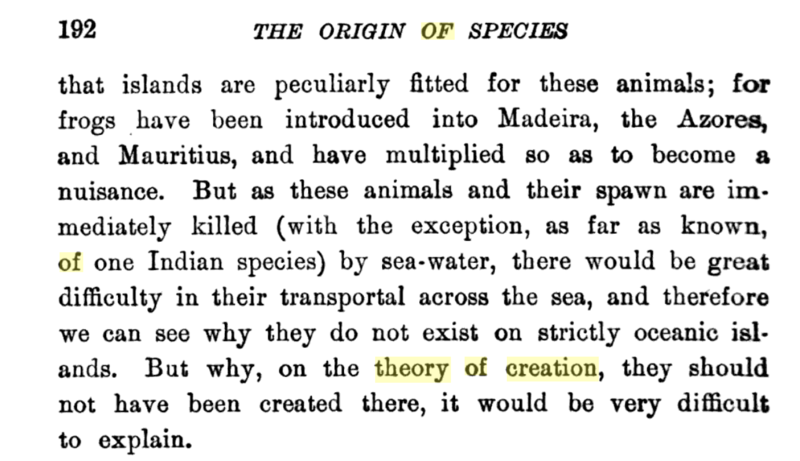 Darwin’s 1859 Origin of Species uses “theory” 134 times (1st edn), most often referring either to (1) descent with modification or (2) natural selection (often “my theory”), but also to alternatives, e.g., “the theory of creation”. What these examples tell us is that, for 200 years, actual scientists writing about science for other scientists have been using the word “theory” with precisely the meaning of theoryC. This is unfortunate. What this means is that an unknown number of students and curious onlookers are being taught an incorrect understanding of what scientists mean when they refer to theories. Redefining “theory” to mean something well established tries to make a shortcut around an assessment of evidence, by saying that “theory” means well-established, therefore when scientists call something a theory they mean it is well established. This is ultimately an argument from authority, i.e., rather than giving evidence for a conjecture, the argument says that scientists who know the evidence have given their blessing to the conjecture by calling it a “theory”. What can be done about this? I don’t know. What I have done so far is just to show that the NAS definition flies in the face of 200 years of usage. However, I haven’t really answered the question posed at the beginning, namely, what is going on, much less how to stop it. I can’t fathom how this error emerged, and how it has lasted so long. I also don’t know what it would take to reverse the error. Simply pointing out the error is not enough. I have pointed this out to some of the sources above. I haven’t received any replies yet. I haven’t written to NAS because the chain of authority for the original 2008 report goes back to a committee of 14 senior people. What would happen if I wrote a letter to all 14 asking them to issue a correction? That would be interesting.